Stratford Homes Timber Bluff | Excelsior Homes West, Inc.
Are you looking for a home with a 1st floor master suite? The Stratford Homes Timber Bluff may be the perfect floor plan for you! The Stratford Homes Timber Bluff is a loft style home with three bedrooms and two bathrooms. This floor plan has just over 2400 square feet of living space with a unique layout. Just off the spacious foyer you will find a L-shaped, eat-in kitchen that opens to the living room with access to the loft space above. This home also features a large master suite on the main level which includes a walk-in closet and master bathroom. Upstairs is a open, spacious loft that can be used for anything (office, extra guest space, game room, etc.). If you are interested in this Stratford Home, contact us today! We can help you find the right floor plan that matches your ideal dream home! The Stratford Homes Timber Bluff is a custom modular home with upgrades and options available. You can customize the Stratford Homes Timber Bluff with options and upgrades available. 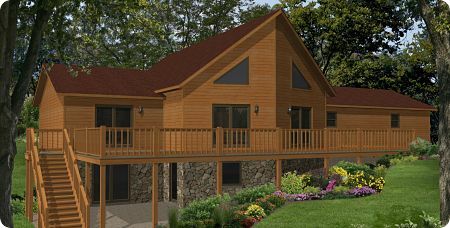 This modular home has numerous materials and finishes to choose from to make the home your own. Choose your countertops, tile backsplash, flooring, cabinetry, exterior finishes, etc. With Stratford Homes, you can design any home into your dream home! This floor plan also has the option of adding a corner fireplace in the large living room. Call today for more information and pricing details. We can deliver modular homes throughout Minnesota, North Dakota, South Dakota, and beyond!